Comino is the third largest island of the Republic of Malta. It is only 3.5 square kilometres and holds 4 inhabitants. It is best known for the Blue Lagoon, crystal water bay with azure color. The location is perfect for snorkeling, scuba diving and rambling. The island is named after cumin flowering plant, which grown in abundance on this beautiful location, classified as a wildlife temple nowadays. 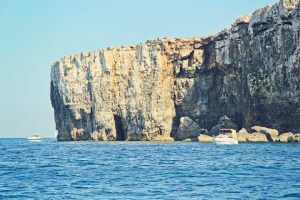 The 2 kilometres long and 1.7 kilometres wide island is housing jagged cliffs, rocky wilderness, two small sandy beaches, a beautiful coastline and deep caves. The tourists going to this island have the opportunity to camp on Comino too. The place is in the northern side of the island, in the Santa Marija Bay, a great place to go swimming and sunbath on the sandy beaches. The area has public toilets and a stone barbecue place. The camping is free and tourists are not required a permit to put their tent there. Enthusiasts of sleeping in the nature can mingle with other people on the subject on several Facebook groups. The island is easy accessible by ferry from many locations on Malta. The shortest trip and the cheapest departs from Cirkewwa, the northern tip of Malta, and it arrives in Mgarr harbour in Gozo. The trip costs around 10 euros and it reaches Comino in 25 minutes. There are departures from Sliema and Bugibba in the summer time, but the price is double to triple, and the travel time is longer. For tourists inhabiting these locations, it might be an option that will save them a long bus trip to Cirkewwa. Tourists can explore the island on foot or by bike, but never get lost, as the 12 metres tall tower of Santa Marija will be visible from all the points of the island. The underwater caves and the coral reefs near the islet of Kemmunett are hot locations for scuba diving enthusiasts.